Winter on Brokeback Mountain. Snow is falling and so is the temperature. But inside the lodge, the cosy open fire and the plaid blankets are keeping everyone indoors, with no sign yet of cabin fever. 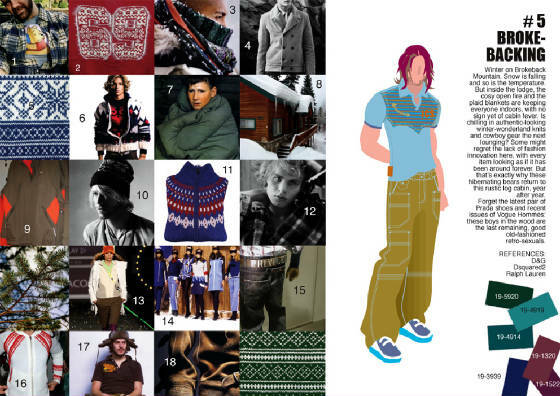 Is chilling in authentic-looking winter-wonderland knits and cowboy gear the next lounging? Some might regret the lack of fashion innovation here, with every item looking as if it has been around forever. But that's exactly why these hibernating bears return to this rustic log cabin, year after year. Forget the latest pair of Prada shoes and recent issues of Vogue Hommes: these boys in the wood are the last remaining, good old-fashioned retro-sexuals.